The Molded Plastic Rocker is a stylish reproduction that accurately preserves the character and beauty of the modern classic Molded Plastic Rocker (aka RAR) and replicates each proportion, finish and detail skillfully and with acute attention to detail and quality. The molded shell chair concept was introduced at the International Competition for Low-Cost Furniture at the MoMA in 1948. This iconic design allowed for the creation of organic shapes that were fresh and new in the world of furniture, and these designs could be mass-produced, ultimately fulfilling their desire to make quality modern design affordable. The Molded Plastic Rocker (RAR) was adapted from an earlier version that was constructed of fiberglass. 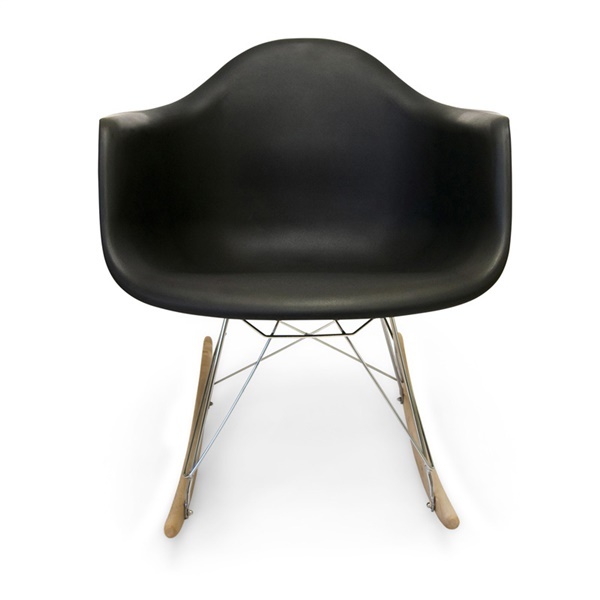 The fiberglass rocker was in fact adapted from a stationary armchair that was introduced as part of the original shell chair collection which debuted at the MoMA. The addition of the rocker base and the recognition it received is a true testament as to how versatile the shell concept was and still is. One of the most distinguished rocking chair designs of the last 100 years, and without a doubt, one of the greatest contributions to mid-century modern design. Now more stylishly relevant than ever, this iconic design has become a mainstay in modern spaces both in the home and in public venues. Inmod's Molded Plastic Rocker faithfully captures the style and quality of the original, and offers several options. It is constructed of fully-recyclable polypropylene, and has a chromed steel wire-base with solid ash wood legs. Its softly matted seat is available in both white and black. Love the chair, such beautiful products I could buy one of everything. First time seeing this eames design as a rocking chair, I had no idea they made them until visiting this site, I had to get my hands on one - it's everything i hoped it would be!! Inspiring take on a classic chair. Was a breeze to put together. Fast shipping too! Kitschy rocker, surprisingly way more comfortable and relaxing then I imagined it could be - I originally bought for it's appearance but I wanted to emphasize the level of comfort! Such a wise decision ordering this for my home and I'm really impressed that there is a rocking chair out there in this style - merges the old school with the new - such an amazing find! I had some difficulty deciding if I wanted to go for this style as a rocking chair or with a solid wooden eiffel base, The rocker was a better choice for my space because it added a different dynamic and some movement in my living room. I think it gives the area a bit more character and so far is the favorite seat for any company that comes over! These chairs rock! metaphorically and literally, love them, i ordered a few and i think they really bring a cool modern but also old school feel to the space, thanks so much! Ordered these rockers in black and they look fantastic! Most rocking chairs i've seen look old fashioned and are rather bulky and large, these are a great size and the design is ultra mod - thank you! Bought two in black! love rocking chairs, these have such an interesting design!